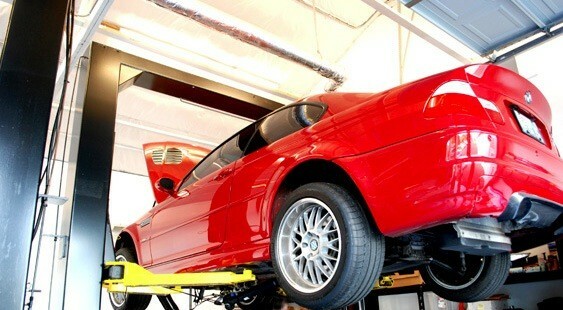 BMW repair and service in Snohomish, WA. BMW Certified Technicians. Genuine BMW Parts. Lowest Prices in the Industry. 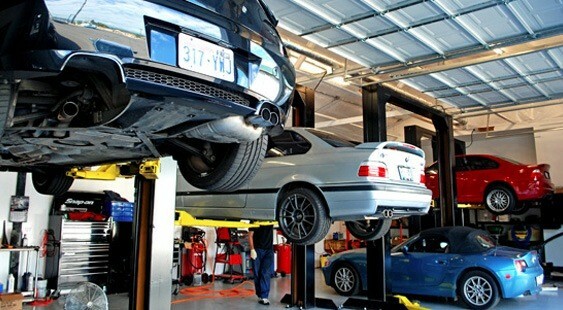 We are Washington State's best Snohomish BMW service, repair and maintenance and center. 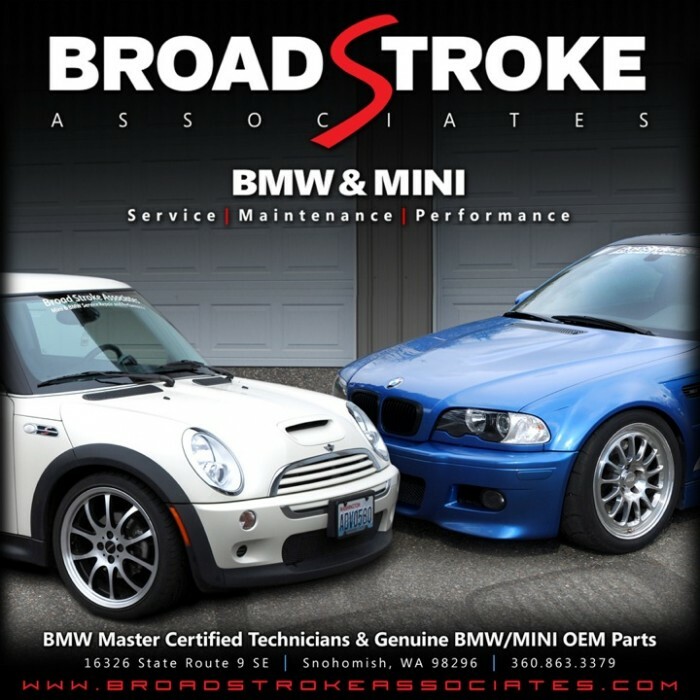 Broad Stroke Associates was established in 2007 with a mission to provide prompt, high quality BMW service, repair, and performance enhancements to discerning customers at the most competitive prices possible in Snohomish. Broad Stroke Associates has the tools and equipment to properly and accurately diagnose BMW problems or evaluate maintenance conditions. This insures that customers are not paying for parts and service that are not required. It also provides customers with an economical resource for their periodic Level 1 or Level 2 inspections or buyer pre-purchase inspections. BMW repair or replacement parts used at Broad Stroke Associates are only of the highest quality. Regular maintenance parts are procured from the original equipment manufacturer (OEM). Performance enhancement is a specialty at Broad Stroke Associates. We have solid experience with engine, transmission, and suspension modifications that perform well. Components recommended are only from reputable, proven suppliers that have good track records of success. If you need help selecting which performance accessories will best meet your needs and budget, Broad Stroke can assist you. Parker Davis is the President of Broad Stroke Associates and is exceptionally well qualified to help you with your vehicle needs. He has an Associates Degree in Applied Science from Universal Technical Institute and is a graduate of the BMW STEP program. Additionally, he has ten years of experience working in BMW dealerships and other import car service facilities. I was referred to Broad Strokes by my colleagues at work after experiencing the frustration of another local “German Car Mechanic” in Everett. Parker and his team diagnosed my car and found answers to all my questions. When my power steering pump went out on my way to Montana they went out of their way to find a closer shop, but in the end I only felt comfortable turning around and going to them. I arrived in their shop just before they closed up for the day and they had me back on the road at 9:00am the next morning. I would never consider taking my BMW to anyone else. Thanks for taking care of me!!!!! If you own a BMW or a Mini and live anywhere between Seattle, WA and Vancouver, BC this is really the only place you should be going to have your car serviced, repaired, or worked on. Parker and his team (including Amy) are amazing – these people know so much about Mini’s and BMW’s. Parker has worked on my car (an MCS) on a number of occasions and, quite frankly, I wouldn’t let another mechanic touch my car, other than my Dad. Not only is their work top quality but you can actually ring them, or email them, or pop into them in person, and ask them a question, or many questions, which they’ll answer correctly. Trust me, if you need any work done on your BMW or Mini go to these guys – you will most definitely not be sorry! And if anyone wants to see how annoyed I get when people service my car badly just check out my other review!! The window motor on our BMW crashes partially open on a rainy Friday afternoon. Knowing that it would be absurd to think we can get a repair before the weekend, I told my wife to call Amy and get on Parker's schedule. Amy called her back and said “Bring it in, we’ll at least get your window up for you.” By the time my wife got to the shop they had the part already en route. And by 4:30 we were picking the car up. Not many shops will pull that off for their customers. Once again, Broad Stroke goes above and beyond expectations. I was impressed with their work and attention to detail before this event. They’re SOLID GOLD. Anyone would be a fool to take their BMW needs anywhere else. Before taking my 2001 BMW to any shop I called every dealer\shop that works on BMW’s to get pricing checked and checked reviews, online. I was told about a BMW auto repair shop off of Highway 9 in the Clearview area by 4 different people and thought that I would check it out. I couldn’t have been more impressed after my first visit. All of the staff is very professional, knowledgeable and they had above and beyond the best PRICING!!! This is the ONLY place that I would take my car and have no need to look anywhere else. It is a great feeling trusting an auto repair shop as many don’t do quality work or the pricing is outrageous. I would recommend this repair shop to anyone and everyone. Well worth the drive for all your BMW repairs. Great Job Broad Stroke!!!!! Parker, Jared, Amy and the guys have done fantastic work on my 2 Minis – everyone who works there seems to be ex BMW or Mini mechanics so they really know their stuff. They’re great to talk to about potential work / modifications . . and are generally just really nice people! I wish they could work on my Volvo too!! Most importantly, for me, I have confidence in their ability to both diagnose problems and then solve them – and the quality of work they do is second to none. Also, they won’t bankrupt you like the BMW or Mini dealer will! I live down in Seattle now but still travel up to Snoho for them to do any work that's needed on my car. The best shop in the Pacific North West, hands down. Parker goes above and beyond any and all expectations and has never let me down once. His knowledge and attention to detail are unmatched and no matter what I need he and Amy are always there to get it done. I love these guys!